Palmetto Dunes 5 * Startseite. 10% Rabatt auf die letzten drei Sommerwochen !!!! Haus, 4 Schlafzimmer, 4. 5 Bäder, Schlafmöglichkeiten für 11. Zu Fuß zum Strand, Golf, Tennis und mehr !! Eine schöne und moderne 4. Reihe Luxus-Haus in einer ruhigen Waldgrundstück in Palmetto Dunes gebaut, die # 1 Family Beach Resort in den USA. Mit einem beheizbaren Außenpool und fünf Meilen von weißen Sandstrand in weniger als 5 Minuten zu Fuß, das ist das perfekte Ferienhaus. Resort Annehmlichkeiten zählen Weltklasse-Golf, Tennis, Radfahren, Yachthafen, Restaurants, Einkaufsmöglichkeiten, Kanufahren und Lagune Sportfischen alle innerhalb einer kurzen Fußweg. Das Haus bietet ein modernes Ambiente mit einem sehr modernen, offenen Layout. Das geräumige, gut gelegene Familienzimmer mit Blick auf den Pool verfügt über viele Sitzgelegenheiten und bietet Kabel-TV, DVD, Kamin und WLAN. Die beiden übergroßen Master-Schlafzimmer haben die Kabel-TV und DVDs als auch. Zu den jüngsten Verbesserungen des Hauses gehören neue Fliesenböden, neue Teppichböden im Obergeschoss, Akzentfliesen, Granit-Arbeitsplatten, komplett renovierte Bäder und frische Farben. Die Küche ist groß und offen und komplett mit allen notwendigen Kochutensilien und Utensilien ausgestattet. Es gibt einen Waschraum mit voller Größe Waschmaschine und Trockner. Draußen gibt es zwei Decks und einen großen Pool Terrasse mit vielen Sitzgelegenheiten und sechs Liegen. Gut in der Gemeinde gelegen, sind Sie weniger als ein paar Minuten zu Fuß zum Meisterschaftsgolf / Tennis, Restaurants, Fahrrad- und Kanuverleih, Unterhaltung, Angeln und unserem wunderschönen Strand. Unsere Online-Bewertungen sind hervorragend. Ein 5-Sterne-Haus, dies ist der richtige Ort für Ihren Urlaub in Hilton Head. Bitte beachten Sie, dass seit der ursprünglichen Aufnahme des Heimvideos zahlreiche Upgrades an Ihrem Heim vorgenommen wurden. Verwenden Sie das Heimvideo eher als einen Durchlauf im Vergleich zu einer Darstellung der tatsächlichen Heimfunktionen. Great house. Lots of space and well equipped. Our little internet/tv issue was addressed and corrected quickly! Hope to stay again! Our guests were wonderful. The internet and TV service went out. We went to the home immediately and checked it out. Finally had to call the provider. They were there later that day to repair the problem. We tell all our guests to call immediately with a problem. We are only 5 minutes away, Great guests. Very understanding. House was good space , upstairs hard to cool down very stuffy and hot. We were very surprised to hear that our guests felt that the upstairs was hard to cool. We did notice that one of the upstairs bedroom windows was open slightly, and that was most likely the culprit. In any event, we scheduled our bi-annual maintenance immediately, and the technicians said that both systems were operating properly. This has been a very hot summer and, more importantly, a very humid summer. Allowing humidity to enter the house will most definitely offset the cooling system. It was an unfortunate situation, but it could have been resolved very quickly. In our information packet that we send to all our guests, we make it a point to tell everyone that we, the owners, live less than 5 minutes away, and we provide our phone number and ask everyone to call immediately if they are having a problem or they are not satisfied for ANY reason. We maintain a 5 Star home, and we want everyone to be totally satisfied with their visit. Thank you. The house was great with enough room for everyone to have their own space. Although the house had the full complement of kitchen supplies to cook a meal, we decided to sample a different restaurant each day for our meals. It was our first time in Hilton Head but it definitely won’t be the last. We had a great time. The whole resort was super friendly and helpful. 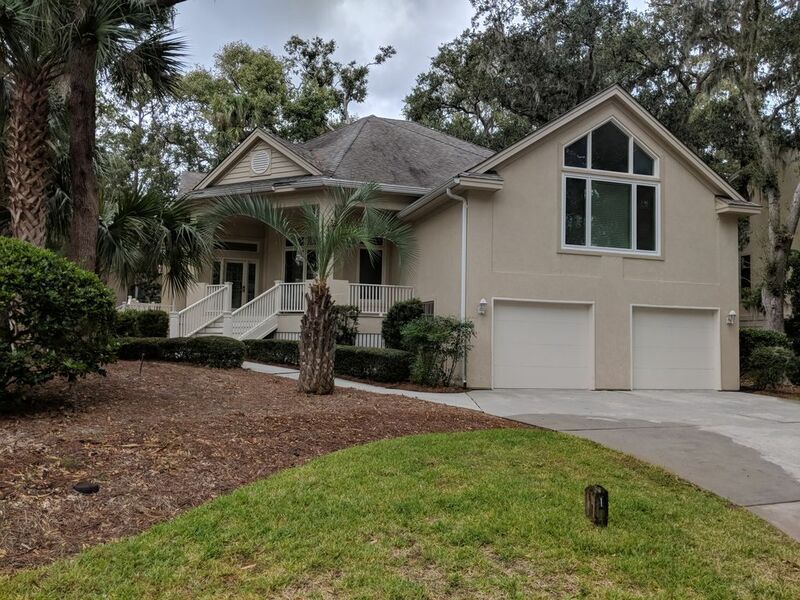 Beautiful home in beautiful Palmetto Dunes. Home on 1 Sutherland Ct., was a large four bedroom, four and one half bath home. Home was clean and quite large. Two beautiful master bedrooms and two smaller ones. Each bedroom had its own bathroom which is a big plus. The bathrooms attached to the master bedrooms were huge. So nice to have a large bathroom. Kitchen was a nice size with plenty of dishes, cups, silverware, etc. Dinette had a massive table that accommodates ten and there were four bar stools at the bar for extra seating. Family room was also a very large room. Entire area was an open concept, which was a plus for us with little children to keep tabs of. The pool served us very well. Not the largest pool, but bigger than we expected. Used it every day. Ocean/ beach is easy five minute walk for adults and just a little longer with wagons and five little grandchildren in tow. Air conditioner kept home cooled nicely, which is crucial when you have 90 degree temps with high humidity. We had one minor issue but owner was front and center within ten minutes and solved the problem. Owner lives five minutes away and is quick to assist with any issues. Honestly, I can only think of one negative, and that would be to have a larger television in the family room. But since you don’t go on vacation to watch television, it was a non issue. Would we stay here again? Most definitely, if I can get this old body to make the over 700 mile drive again, for the ninth time. If you choose to stay at this beautiful home, I hope you enjoy as much as we did. God bless. Our guests were absolutely wonderful. Had an issue with the freezer but had them up and running again within an hour or two. They were so understanding. Like our guest said, we are only 5 minutes away and that allows us to respond immediately to any situation. Can't wait to have them return. They were excellent. Great family. We had a great time. The house was in a perfect location and had all of amenities we needed. Great! Would stay in this house again. We are always thrilled when our guests enjoy their stay. We agree that we are in a great location- mid-island, 5 minute walk to the beach, 5 minute walk to world class golf and tennis, canoe & kayak rentals, Alexander's Restaurant, and the General Store. We are also directly across the highway from Shelter Cove & Marina, and the new Town Center. Our home is extremely well maintained and inspected every week by the Owners. We have numerous guests (friends) that return time & time again. 3 Championship-Golfplätze (Arthur Hills, Robert Trent Jones, Tom Fazio), Tennisplätze der Weltklasse, Kanuverleih entlang der 11-Meilen-Lagune, Sportfischen sowohl vor der Küste als auch innerhalb der Lagune, kostenloser Küstenfischfang oder Inselkreuzfahrt mit dem privaten Boot des Eigentümers ( saisonal). 1. Rates are subject to change without notice. 2. Rates include all applicable taxes. 3. Weekly rentals typically run Saturday 4:00 pm to Saturday 10:00 am, unless different arrangements have been made. 4. A car pass is required for each vehicle and must be obtained at the Pass Office at the entrance to Palmetto Dunes at a cost of $15.00 per vehicle. 5. VRBO assesses a Service Charge* in the amount of approximately 6% of the total rental fee that is payable at the time of booking (* contact us for further details if you wish).